Motorola has launched the Moto E series Moto E5 and Moto E5 Plus smartphone in India as promised. 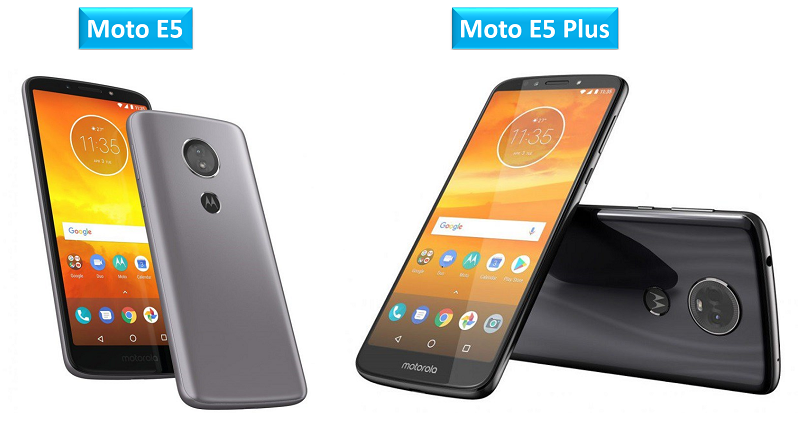 Both of these Motorola smartphones have a 18:9 aspect ratio Max Vision display. They also have a fingerprint sensor, Front-ported speaker, and runs on Android 8.0 (Oreo). While, the Moto E5 Plus has a 3D polymer glass back with reinforced chassis that promises additional strength. The mobile sports a 5.7-inch HD+ 18:9 IPS display with a resolution of 1440 × 720 pixels. It is powered by 1.4GHz Quad-Core Snapdragon 425 Mobile Platform with Adreno 308 GPU and runs on Android 8.0 (Oreo). The device comes with 2GB RAM with 16GB internal storage, the internal storage memory can be expanded up to 128GB using microSD card. The mobile supports 4G VoLTE, WiFi 802.11 b/g/n, Bluetooth 4.2, GPS. It has 3.5mm audio jack, Front-ported speaker, Dual microphones. It has Single / Dual SIM and Fingerprint sensor. The mobile packs 4000mAh battery with fast charging. It has a size measurement of 154.4 × 72.2 × 8.95 mm and weight 174g. The Moto E5 is priced at Rs. 9999, and it comes in Flash gray and Fine Gold colors. It will be available from Moto Hub stores offline. The mobile sports a 5.99-inch HD+ 18:9 IPS display with a resolution of 1440 × 720 pixels. The device comes in two variants with 2GB RAM with 16GB internal storage and 3GB RAM with 32GB internal storage, the internal storage memory can be expanded up to 128GB using microSD card. The mobile packs 5000mAh battery with fast charging. It has a size measurement of 160.9 x 75.3 x 9.35 mm Weight 197g. The Moto E5 Plus is priced at Rs. 11,999, and it comes in Fine Gold and Black colors. It will be available at Moto Hub stores as well as exclusively from Amazon.in online starting from today midnight. For Amazon users on 11th and 12th July, No cost EMI up to 9 months. For Paytm mall app users Rs. 1200 cashback on bill payments for recharges when you buy Moto E5 or Moto E5 Plus at Moto Hubs. Share us your views on the Moto E5 and Moto E5 Plus smartphone in the comments section below.